Cloud environments are widely adopted because of the powerful, flexible infrastructure and efficient use of resources they provide to organizations of all sizes. Whether organizations are using private, public or hybrid cloud environments for infrastructure or software-as-a-service, the common goal is to achieve operational and cost benefits without giving up full control over infrastructure and data. 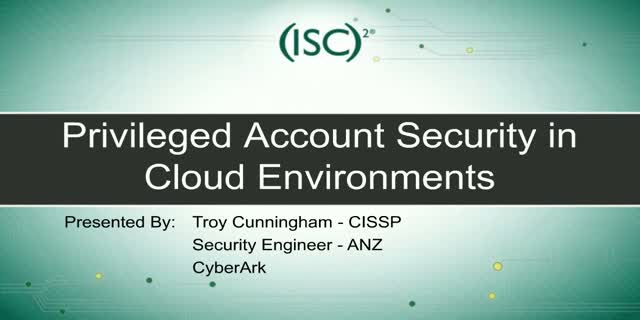 Introducing a real challenge, privileged accounts in cloud environments are at a critical juncture of control and management because once an unauthorized user has access to privileged account credentials, control over the entire infrastructure is in the hands of the attacker. This is where securing privileged accounts plays a critical role in securing cloud environments and meeting audit and compliance requirements. Join CyberArk and (ISC)2 on July 13 (Wednesday) at 2:00p.m. (Singapore time) for a Security Briefings to learn how to protect your privileged accounts in the Cloud.